Finding a suitable wedding band can be a thankless task. You wonder if they are suitable enough for your guests, as well as the happy couple. Some of your relatives’ music tastes may be incompatible with the mother-in-law’s or the father of the bride’s. In many cases, a compromise is met, so you plump for a DJ and/or a wedding band that aims to please all the guests. Choosing a live act demands a degree of thought. Will they play the usual standards or specialise in a certain musical genre? In the latter category, this is where we come in (and who on earth isn’t moved by soul music?). If soul music’s your thing, you can turn to us. A DJ: Yea or Nay? Ultimately, letting the wedding band strut their stuff seems good on paper. You might prefer to have a DJ in place of a live band or vice versa. Or both. If you have both, the DJ could offer continuity whilst the band has a break, or before and after the band’s gig. We at Madison Soul can perform with or without a disc jockey. Whether the venue is a modest sized public house, dance hall, or an outdoor venue, we are flexible. When choosing a wedding band, you may have sorted out a suitable venue for your wedding reception. 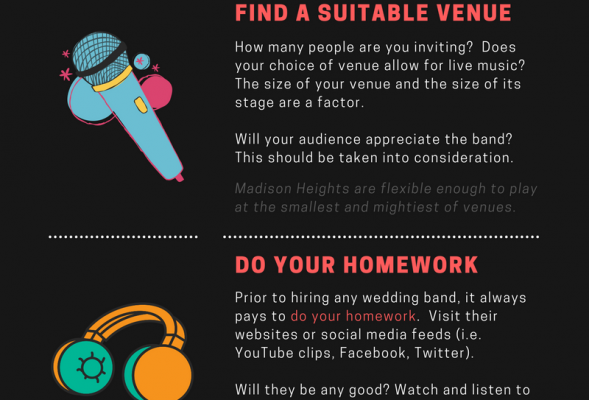 Prior to booking any wedding band and/or disc jockeys, the size of the venue is a factor as well as its audience. There might only be enough room for a karaoke machine or a DJ’s console, let alone a 10-piece soul band. If you’re still stuck for a wedding band, why not consider us? Before you do, why not share our infographic far and wide? Please remember to include attribution to Madison Heights Soul Band with this graphic. Thank you very much. Madison Heights Soul Band, 11 November 2016.